This section contains tips on how to avoid mis-engraving gift items. There's nothing that can cause a grown man or woman to cry more than setting up a difficult job only to find that the gift item was mis-engraved. If you've never faced this problem, take a bow. If you have, take an aspirin and read on. One way to reduce anxiety is to avoid some of the many engraving problems commonly encountered when working with gift items. To do that we must start with one of the leading causes for mis-engraved objects - spelling. It goes without saying that we should always double-check the spelling for accuracy. What we sometimes fail to check is the correct spelling of proper names. When possible, have the customer confirm the name in writing. If you should take an order by phone, have the customer spell out the name for you. It’s amazing how similar Susan sounds like Suzanne when taking an order by phone, or that Lori, Lorrie, Laurie, and Lorri can easily be misspelled. If this isn't enough to cause you to take more care up front, think about the other commonly used words we misspell frequently. Try this list on for size. If you're still using a pantograph (manual) engraving machine, one of your biggest challenges is keeping the stylus from slipping out of the copy. Two items to check are worn out copy and a worn out stylus tip. Another cause of mis-engraving is rushing the job or putting too little or too much force on the stylus. Take the time to periodically clean the stylus and the copy to ensure smooth movement during engraving. If you have a difficult time with centering the engraving on small or non-symmetrical surfaces, try putting several pieces of masking or scotch tape over the surface. With a diamond tip, reduce the down pressure and engrave with a light force. You will be able to see the placement of the engraving without touching the surface. Sometimes it's better to visualize a strange shape as a rectangle or square. If your engraving system is equipped with the ability to set an off-set or new home location, you may be able to simply move the spindle over the part and start the job from there. Moving from the upper left-hand corner of the engraving table versus the upper left-hand corner of the part creates problems for most of us. Some systems work from the top center of the plate as the home position. This can be handy when trying to get proper alignment on an odd-shaped item. If you own an older system without limit switches, you may be able to move the carriage (spindle), out over the piece and start the job from there. Any combination of these options may give you a more accurate set up. This subject really deserves its own book. Ask any veteran engraver about his or her early experiences with "carry-in" engraving and you should be prepared for a very, very long discussion. Horror tales exist that should at least cause you to use a little caution when taking on this kind of work. If you're not providing the item to be engraved, a little advice is in order. Check the item to be engraved thoroughly. This is especially true if the item to be engraved was provided by the customer. Pre-inspect the item prior to set-up for any marks, dings, or dents. Note these with the customer so that you cannot be blamed for them later. Take your time. Don't let the customer rush you into a liability. Check the spelling. In fact, check it twice. Check the work holder before engraving and don't remove the item from the holder until you've inspected it. Once removed, any chance to repair a mis-engraved area may be lost. One last thought. Ask your customer where they bought the item. Check with the supplier of the gift. They may sell special clamps or fixtures for the items they make or distribute or know who does. It never hurts to ask. Pens are a great gift item and never go out of style. They make great awards and personalize easily with the proper tools and setup. There have been plenty of articles written over the years about engraving pens, pencils and sets. I think that the process has been over-complicated in many ways and keeping it simple should be one of your goals. You will need to build a little confidence when doing pens. A lot depends on whether you will provide the pens yourself or take walk-in jobs. Until you build that confidence, I suggest leaving the expensive Mont Blanc pens to the more experienced shop. One of the advantages of engraving pens that you supply is that your cost (should you make a mistake) is reduced. Many times you can purchase extra pen caps to be used in set-ups and as replacements. A little tip - check your local hardware store for copper tube that can be cut into small pieces and used as set up material. Actually, any metal tubing will probably work. Just try to find something that is similar in diameter to the pens you offer. The tube can be used over and over while you master the techniques. The range of products on the market gives you the ability to offer several different price points and initially, limits your risk and exposure while learning how to do these items. Inexpensive pens and pencils can be purchased for a few dollars and can be sold for $15.00 dollars or more with engraving. Many pre-packaged display sets will include the pen and pencil or pen and key ring combination. I recommend selecting only one or two manufacturers until you have the experience to take on different models. If you feature pens and become proficient with engraving them you will have more work than you can handle. Many engraving shops shy away from this kind of work due to the infrequency of the job. Most of the pens and pencils we engrave using traditional rotary methods are made of a metal that is clear coated for protection or plastic coated for color and design. Both styles can easily be cut. Recently, with the advent of laser engraving systems, wooden body pens have become popular. I suggest leaving the wooden pens to the laser process. If you must offer these, find a local shop that will do the work for you. Maybe you can offer to do their metal pens in exchange. Most engraving on pens is confined to a name and perhaps a short message. More engraving may be required if the pen is a promotional piece. Limit the amount of text on the pen and you will probably like the results much better. You will find that most engraving is done on the pen cap opposite or 90-degrees from the pocket clip. Some pens are designed with engraving in mind so an area that is smooth is available on the cap or barrel. In metal-bodied pens, a slight burr can be raised so it is best to confine the engraving to the cap away from the barrel (the area we hold). This is better for the user due to the tactile feel of the pen. You can engrave on the barrel; however it will wear from use and will not be seen by the user. Oxidizing, paint filling of color filling can be done on some pens. Get the recommendation from the supplier on the best coloring methods. If you provide small quantities, say less than a few dozen pens, personalizing them by engraving are recommended. If the quantity required is greater than you can handle, there are plenty of companies that specialize in screen printing, pad printing or hot stamping. Many companies will customize the clip or epoxy the cap dome with a corporate logo. You may contact someone in the “ad specialty” field if your volumes are high enough. They will specialize in low cost, high volume jobs. Use a pen holding clamp to secure the pen for engraving. Figure 8.5 shows just one example of many (incidentally, this configuration will also work for holding seals). Often times you can remove the pen cap and only mount it for engraving. Do not over tighten, you may crush the pen or cap. Also, you may want to use a little tape to protect the pen from the clamp or fixture, this will keep it from becoming scratched when clamping. Make sure that the pen cap top is pointed to the right when engraved. Usually you will read the pen as shown in Figure 8.6. Avoid multi-line font styles. They do little to create an attractive appearance. I prefer a simple single line script font, Futura, gothic or if necessary, a 3-Line Roman. Expand the text to 120%. The character height of the letter may be as small as .070" on a slim pen or as great as .150". I prefer to stretch out the text a bit so that small characters or lower case characters do not lose their definition. Avoid using too much down pressure. This will raise a burr in both metal and coated pens. This burr cannot be removed without damaging the pen so more than one pass may be the correct answer. For pens with a dramatic diameter difference between the cap and body, use an adjustable pen fixture. If you do not have a clamp like the one shown above, wrap tape around the body of the pen so that it is secure when clamped. If your engraving system has a limited Z-axis float, use a burnishing adapter. That's if it can even be used when doing diamond drag work. All you are trying to achieve is the increased stroke to float with the surface diameter. Note: It is critical that you watch out for characters that have descenders such as g's, y's, j's etc. These letters that fall below the baseline may not have been considered in your set-up and due to the curvature of the pen, you may miss engraving the bottom of the character. Keep the message concise and don't try to be too clever with the engraving, especially when attempting pens for the first time. Limit your risk by providing pens until you have the confidence to take on customer supplied items. Don't be discouraged if the first few don't come out perfect. Save your job layouts and you'll eventually feel comfortable tackling these great gift items. Here's an item that never loses its appeal. ID or identification bracelets are easy to engrave and can be sold for all occasions and are inexpensive enough for even the smallest of engraving shops to offer. Popular with teens or even men or women of the business world, these personalized gift items will always be in style. Some ID bracelets serve a practical rather than a decorative purpose. People that have a medical condition or those that need to warn others of their special health problems will wear an AMA approved bracelet. These will have a Medical Emergency Emblem alerting those in attendance of the condition. Those with diabetes, heart conditions, asthma or allergies will find several Medic Alert versions available. Most bracelets are wrist types; however it is possible to find anklet types worn by women. Most bracelets will accommodate at least the name of the person wearing the bracelet. Many times the gift giver will request that some personal message or date appear on the underside. Regardless, these are easy to engrave. ID bracelets usually have a rope style chain with clasp that must clear the engraving tool. 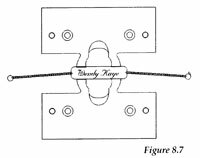 I recommend any number of workholding clamps that will secure a bracelet (See Figure 8.7). Check with any equipment manufacturer and you will find something in their offering to accommodate these items. If you do not, check with the bracelet manufacturer. They will often sell workholding clamps for their products. As long as the chain is not in the way of the engraving head, and the bracelet is secure, you can engrave it. Determine if the bracelet is to be worn on the left or right wrist of the recipient. If the bracelet is being worn on the right wrist, I place the clasp to the left when securing it in the workholding jig. The objective is to make it easier for the wearer to secure the clasp. I generally set up most bracelets this way if the wearer is right handed. You will find that they already wear their watch on the left wrist. Select an attractive font for the job. I like a bold look for men's bracelets and something lighter for the women. Use a block type, old English or 3 line Roman for the men's and a connecting script font for the ladies. Don't be afraid to use the full name. Short names such as "Bob" or monograms look awkward. Expand the text or incorporate ornamentals to fill the space. Italicizing the text can add a nice effect but I wouldn't recommend anything that detracts from the natural beauty of the bracelet or design. If you do italicize, be sure that your left and right margins are the same after italicizing. If you must engrave the back of the bracelet, keep it simple. The look here should not over power the front. I recommend a gothic or script font and slightly smaller text. Turn the bracelet over and engrave the message so that it faces the same way as the name on the front. On Medic Alert bracelets a considerable amount of text may be required. Try using a gothic font or other single line font so that you can have the room to get the entire required message onto the bracelet. If the name is short, you may want to try setting up the job with only capital letters. If using lower case characters, be sure that you've considered the letters with descenders when setting up the job. Letters such as y, j and p will need special attention. If you have these in the name, try centering the name on the bracelet leaving the same top and bottom margin from the top of the capital letter to the bottom of the descender. The techniques for engraving ID bracelets are the same, as any other slightly curved surface and you will find that diamond drag is preferred. If your engraving equipment has a limited amount of Z-axis travel (stroke), use a burnishing adapter with your drop in diamond tool. You should not have any trouble reaching the entire width of the bracelet with your message. Some ID bracelets have a very polished surface and may look better burnished however, if a bold look is required, I would switch to a multi-line font style. If you're not offering ID bracelets as a Valentine, Mother's Day or Christmas gift item you should. Any retail shop with walk in traffic will find these items to be popular and profitable.